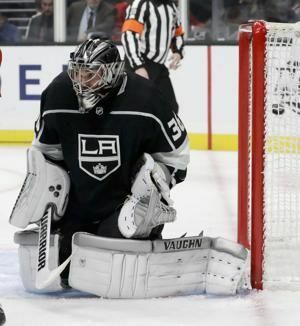 LOS ANGELES - David Rittich stopped 21 shots for his first career shutout and Travis Hamonic scored to help the Calgary Flames to a 1-0 win over the Los Angeles Kings on Saturday night. PHILADELPHIA - Phil Booth scored a career-high 23 points, and No. 9 Villanova routed Quinnipiac 86-53 on Saturday night. Booth made three of Villanova's 12 3-pointers. The Wildcats (2-0) shot 47.1 per cent from the floor. Villanova led by as many as 37. The Wildcats (2-0) outrebounded the Bobcats 50-29, including 20 offensive rebounds that led to 26 second-chance points. Collin Gillespie went 4 for 6 from 3-point range and finished with 16 points at the Wells Fargo Center. Senior forward Eric Paschall had 11 points on 4-of-6 shooting, added eight rebounds and three assists. EDWARDSVILLE, Ill. - Adam Pickett made 5 of 7 shots from 3-point range and scored 24 points to help Winthrop beat SIU-Edwardsville 94-82 on Saturday night. 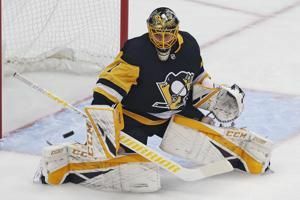 PITTSBURGH - Sidney Crosby had a goal and an assist, Casey DeSmith stopped 39 shots and the Pittsburgh Penguins beat the Arizona Coyotes 4-0 on Saturday night to snap a five-game losing streak. While the Bruins continue to seek secondary scoring, the first line keeps trying to prove they have nothing to worry about. 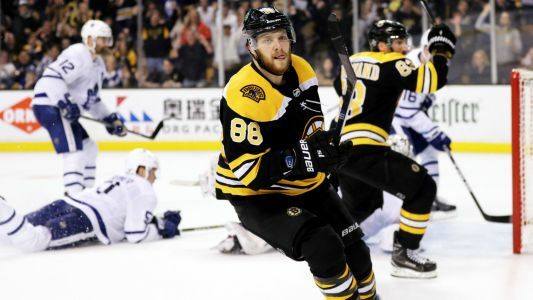 David Pastrnak picked up a hat trick with an assist, Patrice Bergeron contributed a goal and two helpers, and Brad Marchand had two assists as the Bruins skated past the Maple Leafs, 5-1, handing Toronto its first road loss. It was Pastrnak's second hat trick this season and the fourth of his career. It also was the Bruins' third hat trick in eight games on home ice this season.